Want to know a subtle and sneaky thing that could be making you feel tired and irritable? Giving you headaches? The answer is mild dehydration. 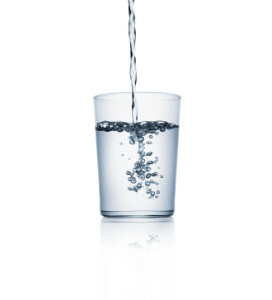 Or, on the flip-side, drinking enough fluids is a super easy way to give you more energy and improve your mood. Who doesn’t want that this time of year (and all year long)?! Being adequately hydrated will also help you digest foods well, circulate nutrients throughout your body, and keep you regular. Which only leaves one question: how much do you need to drink? Is the popular advice of “8 glasses of water a day” right? In short, no. Your needs will vary from this if you’re particularly petite, large, physically active, or vacationing in a hot location. Your individual sweet spot is the amount of fluids where your pee is clear to light yellow, but you’re not needing to pee non-stop all day and night. Start with the amount I’ve listed above and adjust to find your sweet spot. Coffee is dehydrating. Myth. That’s right, this one isn’t true. Coffee and tea aren’t dehydrating. Go ahead and count them towards your cups of fluid per day. Alcohol is dehydrating. True. Yes, alcohol is dehydrating. (Now you know why I planned this Nutrition Game Changer for the holiday season.) Add an extra 1 – 2 glasses of fluids for each glass of wine, beer, or booze that you drink. So, What Counts Towards Drinking Enough Fluids? Water (plain, fizzy, or flavoured). Milk and plant-based milk alternatives. Pop (or “soda” for you American readers). Yes, it does count. But relying on it frequently will send you over the recommended amounts of sugar. Electrolyte drinks (e.g. sports dinks). They have a role if you are exercising for 1 hour or longer and/or sweating excessively (e.g. in a hot and humid location, wearing heavy equipment). That sweat you’re losing is salty so you need to replace both fluids and the salt (a.k.a. electrolytes). Athletes in training will have additional fluid and nutrient needs. That’s a different situation than I’m covering in this post. If it describes you, I recommend connecting with a sports dietitian.